Small Cabin Forum / Off-Grid Living / Probably the 10,000th solar build help thread. I am looking to piece together a solar kit. 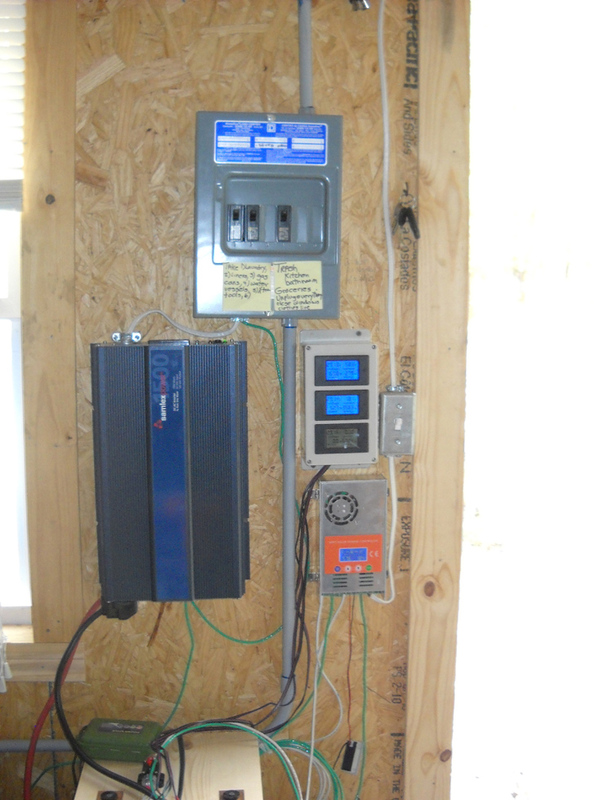 The plan is to wire a 12x16 cabin completely off the grid using a small 4-6 space breaker box and household outlets. It will utilize (8), 9 watt led high hats, 2-4 led lights on the exterior, a 32ish sized TV (cheapest and most efficient I can find), a 110v water pump for running water from a small storage tank, a Bluetooth speaker, up to 3 cell phones and if I can swing it; a small apartment/dorm style fridge. This would be a recreational cabin for weekends and extended weekends. I’m hoping that the set up I choose will last 3 days while I’m there and will be able to charge over the week(s) until my next visit with minimal winter usage. What kind of system can I get away with to accomplish this without going overkill? I need an inverter that I would be able to directly feed into the breaker panel. Pure sine? I’m figuring that the lights will be run for a max of 5 hours a day if that and not all simultaneously. 3 of the 8 will be in the loft/”bathroom” I left out the outdoor lights to factor in the interior not being used. TV 2 hours max depending on weather. If its not raining ill be at the fire pit with a cold one. Cell phone, speaker, and one or two miscellaneous items such as a GPS unit charging on occasion and as needed. Fridge consistently on for the duration of the stay. What I’ve gathered is they are generally low wattage, but peak greatly on start up. Which is why I’m not so sure of how doable it would be. Im currently eyeballing this https://www.solar-electric.com/samlex-pure-sine-wave-inverter-pst-1500-12.html inverter, which would wire directly into my electrical panel, but I would be a lot more comfortable spending around $200 instead of the $520. So if anyone has any other suggestions on that. My maths isn’t the best and all of the watts, amps, kwh, kw, watt hours calculations are making my melon hurt. So all in all, im unsure of what wattage panels I would need and how many, how many golf cart battery array I would need and their voltage (12v? ), as well as if there is a better option inverter or if that one isn’t even good enough for what I need. Also a recommended charge controller. Appreciate any help I can get and sorry for long post, trying to give as much info as I can. OK, been getting lots of help from this forum so will try to give back a bit, but here's the caveat, I'm not the most experienced guy here and my build is currently "in progress" as well so take this as free advice, perhaps worth only that. It sounds like the whole cabin is going to be wired with standard household 120v wiring, correct? So that's pretty straightforward, but you still need to be sure you do the math on voltage drop for the wiring up to the inverter, lower voltage wiring has much greater drop. In a word, yes. Treats all sorts of equipment better (lots of sensitive electronics won't run at all on modified sine), and price difference isn't that big anymore anyway. What kind of water pump are you talking about, just for domestic water flow in the cabin or are you talking about a well pump? If this is well pump you can have giant startup surge loads. I'll trust you've done the math right on your totals here. But one thing to keep in mind is inverter loss... for example, the inverter you're looking at below is 85% peak efficiency... that means you're losing 15% of your power in the inverting process. So your 11240 watts becomes 13223, and your 1880 becomes 2211 for the three days. Also, that inverter (as they all do) draws power just to run itself, this one seems to spec itself at ~1a (@12v), so that's another 12 watts per hour. So NOW your 3 day total with fridge comes to 14087 (11240 / 0.85 + 864), no fridge comes to 3075 watts. ... scroll down to battery calculator. But that's assuming constant use all month, if you're just doing 3 day weekends then you can drain the batteries down and have solar fill it back up. Depending on the kind of batteries you go with will show how far down you can draw the batteries (lead acid no more than 50%, lithium down to 80%). Lead acid is also less efficient than lithium so you factor that in. Lead acid: 14kwh over three days means you need 14*2*1.2 = 33kwh of battery capacity, or 2,750 amp hours @ 12v... now find out how many amp hours the batteries you're looking at provide at 12v and divide the amp hour number above. For reference, a marine/RV Trojan 12v battery provides ~100ah capacity, leading to 27 batteries. Not realistic. So you can try it without the fridge. Lead acid: 3kwh over three days you need 3*2*1.2 = 7.2kwh of battery capacity, or 600 amp hours @ 12v. 6 batteries. More believeable but still alot. All of the above calcs change depending on how much solar you can generate, and that depends on panel output, time of year, and where you are in the country. At the very least you want enough to generate the depleted batteries all the way to full relatively quickly, both so they're ready next time you're there and because lead acid batteries don't like being left for long periods of time below full charge. What's really killing you here is 130 watts per hour for your fridge. I assume that's what the fridge draws when running... it shouldn't run all the time so don't just do 130*24 for your watt hours for a day, although if you put warm food in a fridge that's been off (or, you know, warm beer) it will run hard to cool everything and itself down at first. But 130 watts when it's running is still very hard to sustain. As you can see from the above, conservation on the front end saves huge on the production / storage side. Less watt hours used = less panels, less batteries, smaller components. From my perspective, you seem to be going at this the right way, you're figuring out your draws and then working backward from there. Not sure when you're planning on starting this but it will take some iterations before you get it all figured out... I'm on version 4 of my schematic so far. 1) Find a better fridge. That 130 watts seems crazy for just a dorm size fridge. Yes you will pay more but it saves you so much on battery and solar. 2) Expect to pay for quality components... the "deals" often have sneaky downsides, like 85% efficiency versus some inverters that are 93% or better. 3) Try to get a handle on your draw and your solar input and then figure out your storage. Lithium vs lead acid, 12v vs 24v vs 48v (for a smaller system 24v is often a good compromise... more efficient than 12v, but the equipment is still more reasonably priced than the 48v stuff), series vs parallel etc. 4) For solar controllers, MPPT is usually more effective than PWM (definitely so if you go to a higher voltage battery bank like 24v or 48v), I'm a big fan of Victron equipment because I've used it before and liked it, their MPPT controllers have a Bluetooth enabled app that lets you see all your production at a glance on your phone. 1) For domestic water, use RV style 12v pump (1.7-2.7amps or 20-32 watts). 3) If you take the fridge out of the 120v equation you could use a smaller inverter (assuming you have generator or something that can run the occassional big load like a power saw or something), the Morningstar SureSine 300 is a very popular, small inverter... only 300 watts (600 watts surge) but efficient (92%) and very low self power draw (55ma if in standby, 450ma when there is no load on it). That would be enough to run the TV, charge phones, run the lights etc, probably even all at once (I'll let you check the math on that). I am in fact planning a split system for our (larger) cabin, with a large less efficient inverter charger to charge the batteries and run big loads and then the ability to switch to the SureSine at night when the loads are small and we want the more efficient inverter... plus it would make for a little redundancy for us. You could go all 120v and still go with a more efficient fridge too, both the items I linked to above run off AC power as well almost as efficiently. If you have more questions ask, maybe someone who knows (A LOT) more than I do will chime in as well. I doubt your fridge is running 24/7. Get a Kill-a-watt meter or equivalent to measure the actual amount used. Yes the cheap ones can spike at start-up. Mine runs at about 60 watts while on but spikes over 700 when starting. offgrid covered a lot of stuff but I would add my .02 worth. Since you are starting from scratch I would go with a 24V system. Your battery bank voltage determines how much wattage you can feed your CC with and with 12V it's not much. I have the Samlex PST-1500-24 inverter and so far it's been great. +1 on the Kill-A-Watt. You can have it track how much something uses over a day and makes the figgerin' real easy! Wilbour's system is probably all you need. I would check his posts. It looks like your loads are well over done. Which is a typical load analysis. Folks put in all these lights they never use and then run them for 5 hours each and then use that load calc. When in reality they turn on one light for 1/2 hour as they go to bed. Or your fridge calc. As Wilbour points out. A small fridge from a big box will use around 3-500w per day. Yet you have yours specced at an astonishing 3200 per day. Almost 10x its actual draw. A small 500w inverter with say 2kwh of lithium battery and a small MPPT solar controller. You're off to the races. A general note: |Pure sine inverter. MPPT solar controller. This is the best value for money right now. It sounds like the whole cabin is going to be wired with standard household 120v wiring, correct? What kind of water pump are you talking about, just for domestic water flow in the cabin or are you talking about a well pump? DeltaDelta, it sounds like you are thinking about a very similar setup to mine. We have a 12x16 as well, I wired the whole thing as if it was residential. I used romex for everything, and standard switches, outlets, and junction box. I used a small circuit breaker box and jumped one of the breakers to be a cutoff for the whole system. I ran romex from there to my inverter, which has a standard edison outlet, I just put a plug on the end of the romex and plugged it in. 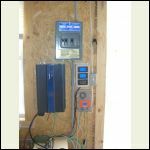 There's a lot of good information on here, and creeky is a wealth of knowledge- I modeled my system after some of the work he's done: it's a 48v system using a Chevy Volt battery pack for storage, a Victron MPPT charge controller, and a Victron Phoenix 800W inverter. It's been in place for a year now, and I am very happy with it. We use LED lights for all the lighting and outlets mostly to charge devices (phones, laptops, a small bluetooth speaker). I would echo what creeky said: Lith-Ion for storage, MPPT power controller, pure sine inverter. I like the Victron, they have an app that connects using bluetooth that is great for monitoring and settings (as offgrididaho said). To echo offgrididaho's comments, look for an inverter with high efficiency, and make sure it has a low voltage cutoff. Good luck! Solar is awesome, and has never been more affordable. Good luck with your system. I've got 3 videos I made on designing/installing my system that might help you out. I will tell you they are more "edutainment" than straight up educational. I also have a couple videos where I do some wiring. Here is a link to my first video of 3, although the second and third videos seemed to be most popular with viewers. Hey Mike, do you get much snow? If so, I'd be concerned about the conduit that runs from the panels to the edge of the roof. We don't get too much snow, usually a couple storms per year with maybe an inch of accumulation. One of my summer to do list items is to run the wire straight up to the ridge and then under the cap and across. nice videos Mike 870, I enjoyed them,how about a long painters pole for a broom handle so you dont have to climb the ladder to get the snow off? I took a ladder ride once on a snowy surface and it didnt feel good. Yea that is a great Idea, we don't get much snow but it sure beats climbing up on the ladder.